Option 1: Namibia Safari Workshop to Etosha is scheduled just before this Chobe safari so that if you desire you can do both safaris in one trip to Africa. See information for that workshop, check details here. Discount given if both safaris are booked at the same time. Contact us for details. Option 2: One day post Chobe River Safari to Victoria Falls, Zimbabwe. Price TBD. minimum attendance required. See details below. If this extension is selected, departure date is August 31, 2017. - Use of professional Nikon Cameras and 600mm or 500mm lenses for all participants. - Customized photo boat with 360 degree clear field of view swivel seats and Wimberley Gimbal heads. - A top safari destination where the wildlife is unparalleled and opportunities for images abound. - The Chobe has one of the highest concentrations of wildlife in Africa and the dryness of August brings all the animals down to the water where we have eye-level viewing. Our trip of 8 nights and 9 days will include 9 days on the magnificent Chobe River in Botswana, Africa in a specially designed boat that allows photographers the ability to see their subjects and do their work. We will focus on the wildlife activity that is so rich and vibrant at this time of the year. Coupled with exquisite first and end of the day light, the eye-level shooting that our boat provides will allow you to capture some of the most beautiful and dramatic images possible. 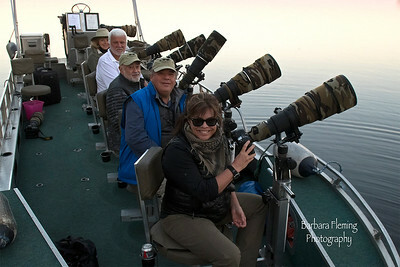 Each photographer accompanying us on a Chobe photographic safari will have the luxury of his or her own swiveling photographic chair with a 360 degree field of view, gas-strut column equipped with a Wimberley Gimbal head and a cranking system that not only extends up and down but which can be moved closer or further away from the photographer. 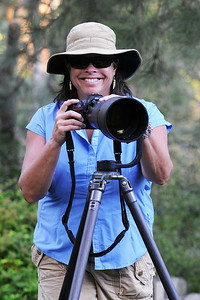 At your option, the safari will provide Nikon bodies and lenses for your use during the trip. Double gimbal heads available on rental should you wish to mount your own camera/lens setup next to the provided ones rather than hand hold them. Lodging is a four star Lodge located on the banks of the Chobe River. You are on the water and photographing within 3 minutes of departure from the lodge. Each room has an ensuite bathroom with flush toilets, air conditioning and electrical outlets sufficient for all photographer's needs. Each room has its own private patio. Work on the river is augmented by two to three hours of classroom work daily (optional) in an air conditioned classroom, with space for your laptops and uploading your recent shots. Individual and if desired group critiques speed learning. Instruction on workflow, image rating and integrations with Lightroom or Photoshop are included for those with interest. The goal is to help you learn from what you have just shot and to anticipate and improve at the next outing. We provide you with some of the best world-class instruction, both on and off the water. Day 1, August 22: Arrive at JNB airport. Meet and greet and overnight accommodations at hotel on the airport grounds. Day 2, August 23: Morning flight from Johannesburg International Airport to Botswana. Transfer from airport to Lodge, where we will have an afternoon photography session on the river. After freshening up, meet for sundowners and Dinner. Day 3 -8, August 24-29: 6 am meet up at Jetty for coffee and rusks, and depart for photography session on Chobe River until 10 am. Return to lodge for a well-deserved brunch. Classroom instruction 11 to 1. 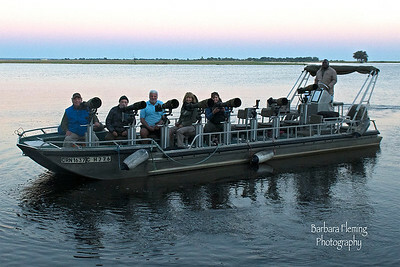 At 3:00 we return to the Chobe River for an afternoon photography session until 6:00pm. After freshening up, meet for sundowners and Dinner. Day 9, August 30: 6 am meet up at Jetty for coffee and rusks, and depart for final Photography session on Chobe River, brunch. Transfer to local Airport, fly to Johannesburg International Airport. Connect with you evening flights home. Day 9, August 30-31: Victoria Falls, Zimbabwe. Following brunch in Chobe, we drive about two hours to Victoria Falls, one the Seven Wonders of the Natural World. Straddling the border of Zambia and Zimbabwe, this falls flows 300,000 gallons of water a second in the high season and is the widest continuous falls in the world, over a mile in width. Water falls twice the height of Niagara Falls, generating a constant mist which in turn creates a unique eco-system below where it rains 24 hours a day and a lush tropical forest abounds. Fees will include transfer to the Falls, fees to visit the falls, overnight lodging at the Victoria Falls Hotel, one of Africa's 5 Star Accommodations, meals, and return to Johannesburg International Airport on the 31st for departure to your home. Chobe Safari Lodge, on the river and steps away from our boats. See above for more info. After one last early morning photo trip, we will depart Kasane Airport for Johannesburg International Airport and you may transfer to your flights home. Those on the Victoria Falls extension will depart on the 31st for Johannesburg. Victoria Falls Hotel - For those who want the extension to Victoria Falls, one night at the Victoria Falls Hotel. Next day flight to Johannesburg for flights back home. One night's lodging in Johannesburg South Africa upon arrival Round trip airfare from Johannesburg to Botswana landing at an airport few minutes from the lodge. Professional guidance and instruction will by highly-skilled wildlife photographers and a photographic instructor with International Photo Competition Judging Experience. Smaller lenses for up close work, your own camera body, and your own computer or laptop. All these are optional but strongly encouraged. Please enter your infomation using the form below. After you submit, you will be redirected to PayPal to make a secure payment. You do not have to have a PayPal account.